Just like in his playing days, Juan Marichal gets a little lost in the rich pitching history of the Giants. During his career he was overshadowed by such greats as Koufax, Gibson, and Seaver. On this list he has to take a back seat as well. 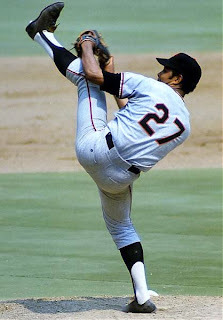 Marichal was known as the "Dominican Dandy", and let's face it, for the leg kick pictured above. I grew up with that photo on the wall of my basement. So many times I tried to mimic the leg kick, so many times I almost hurt myself trying. My dad was a huge Marichal fan and would talk about him with great affection. The July 1963 game that Marichal pitched against Warren Spahn is the stuff of legends. He went 16 shutout innings, striking out 10, and allowing 8 hits. Spahn matched him pitch for pitch. Finally in the bottom of the 16th, Mays won it for him with a solo shot. It was an amazing performance. Juan Marichal made 446 starts as a Giant. He compiled a record of 238-140 with a 2.84 ERA. The man won the most games in the 1960's yet never won the CY Young award. His one "off" year in the 60s was 1967, when teammate Mike McCormick won the award. He was a 9 time All Star, that threw 244 complete games in San Francisco. Marichal led the league in innings pitched twice, and threw a no hitter in 1963. In 1965 Juan had 10 of his 52 shutouts as a Giant. This is one of those ballplayers I wish I had been alive to see. Juan Marichal was voted in to Hall of Fame in 1983. The greatest left handed pitcher in the history of the Giants organization is Carl Hubbell. The master of the screwball. The man that once struck out, in succession, Babe Ruth, Lou Gehrig, Jimmie Foxx, Al Simmons, and Joe Cronin. That's 5 Hall of Famers, and Hubbell did it at the Polo Grounds in front of the home fans. He once had a scoreless streak of 46.1 innings, still a franchise record and 6th best all time in all of baseball. He was known as "Meal Ticket" and his stats showed why. Hubbell was a 9 time All Star. The game wasn't invented until his 6th season. Three times he led the league in ERA, and once in shutouts. Notching a career high 10 goose eggs in 1933. He had 36 shutouts all time. Between 1931-36 Hubbell completed 21 or more of his starts each season. It makes sense then that he also was in the top 5 in innings pitched every year between 1932-37. Hubbell could be so dominant that he won the NL MVP twice, in 1933 and 1936. 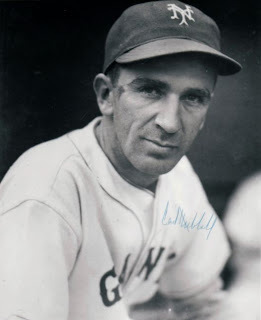 Carl Hubbell, and his Screwball, was elected to the Hall of Fame in 1947. The most dominant pitcher of the beginning of the 20th century, was Christy Mathewson. I know Walter Johnson was amazing as well, but "Matty" was without question the best in the NL. He used his famous "fadeaway" pitch to fool hitters as well as blow fastballs by them. Mathewson achieved a pitching feat that is unmatched in the fall of 1905 against the Philadelphia A's. In the span of 6 days he threw 3 shutouts to help the Giants win the World Series. All 27 innings, only 13 hits, 1 walk, and 1 hit batter. He struck out 18 of the 94 batters he faced. Nothing like that will ever happen again. 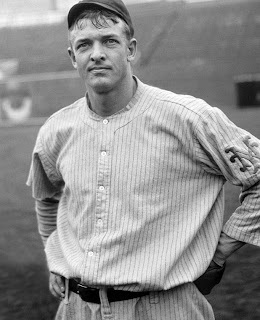 Christy Mathewson had a career record of 373-188. He pitched, and won, one game for the Reds. Otherwise everything was in New York. In 1905 and 1908 he won the pitching triple crown, leading the league in wins, strikeouts, and ERA. Christy threw 11 of his 79 shutouts in 1908, and lead the league in the category 4 times. He had 434 compete games. Which is crazy, it's one more game than Hubbell started. Mathewson's career ERA was 2.12 and 5 times he led the league in strikeouts. Christy Mathewson was part of the inaugural Hall of Fame class in 1936.